ManageEngine ServiceDesk Plus puts you in the driving seat when it comes to resolving IT support incidents. 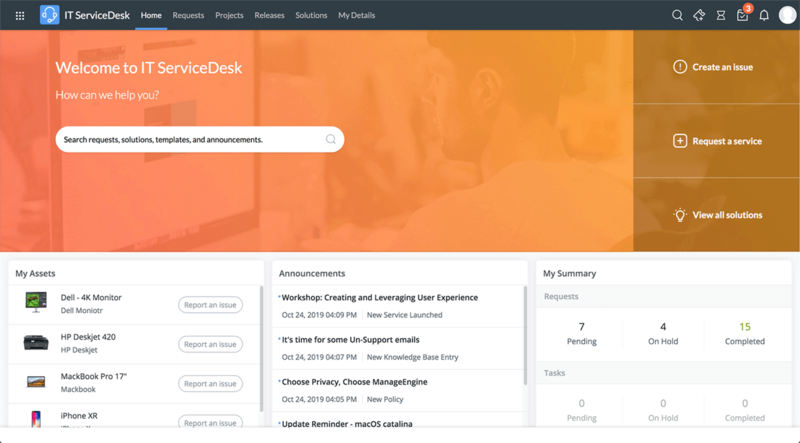 Whether you are looking to reduce the number of phone calls and emails being received by your help desk or give users the ability to raise calls themselves, ServiceDesk Plus is the IT help desk software that does it all, and so much more. 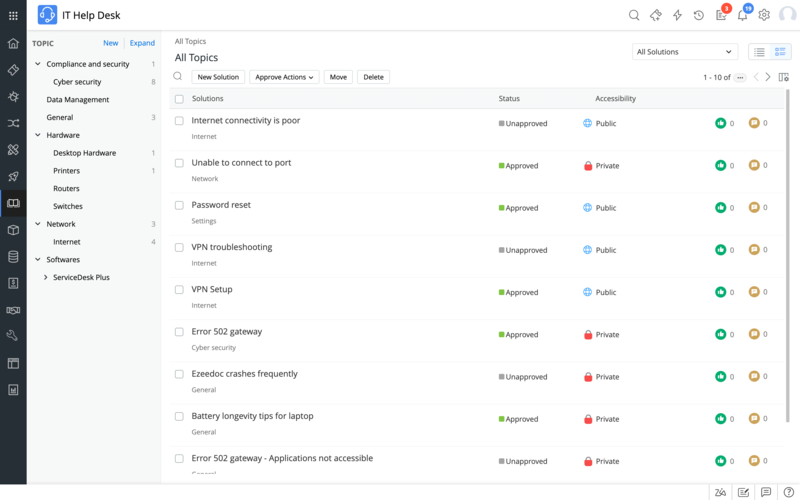 The self-service portal feature within ServiceDesk Plus has been designed to give user's their own support portal that they can use whenever they need to create or check the status of a support ticket. By giving users this functionality you reduce the amount of calls they need to make and also allow them to see the status of their calls so they do not need to chase your help desk staff. Technical outage notices can also be announced on the self-service portal for all to see. Learn more..
A well populated knowledge base is great for imparting information with users on problems they can solve for themselves. You can build the knowledge base to your exact requirements and also use it to share resolution instructions between technicians. Learn more..
Do you receive a lot of emails to your IT mailbox? Does it take a long time to turn these into support tickets? You need IT help desk software that can automatically convert emails into tickets and that is just where ServiceDesk Plus comes in. 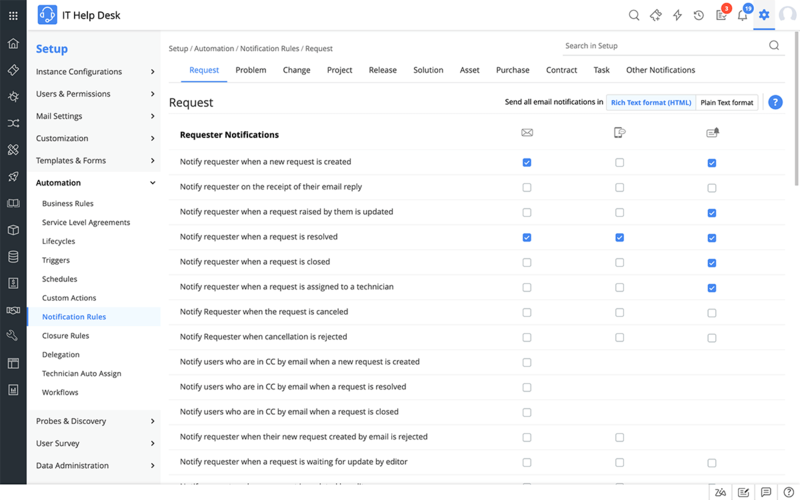 Email request functionality can cut down on administration time dramatically. Learn more..
Providing 24/7 support across multiple sites in different geographical locations can be a chore, but with ServiceDesk Plus it becomes simple. With this IT help desk software you can effortlessly manage requests and assets across as many sites as you need to providing your organisation with the best support possible. Learn more..
By incorporating SLAs into your IT support service you give users the best assurance that their call is going to be resolved within a set time. 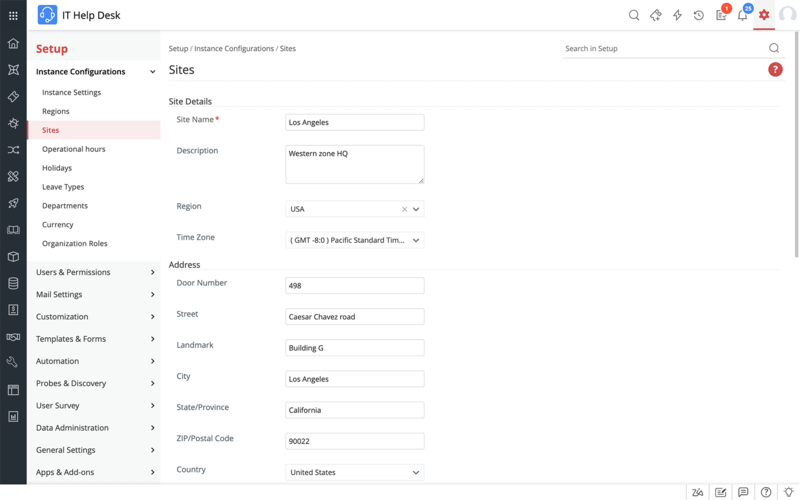 ServiceDesk Plus allows you to define your SLAs and will notify you when an SLA has been violated. Learn more..
ServiceDesk Plus is an IT help desk software that allows you to integrate with any third party software with API integration. This allows you to manage any requests or other events that have been created in another place. Learn more..
Wouldn't it be great if your IT help desk software was able to automatically assign requests to different technicians, levels, categories or priorities? 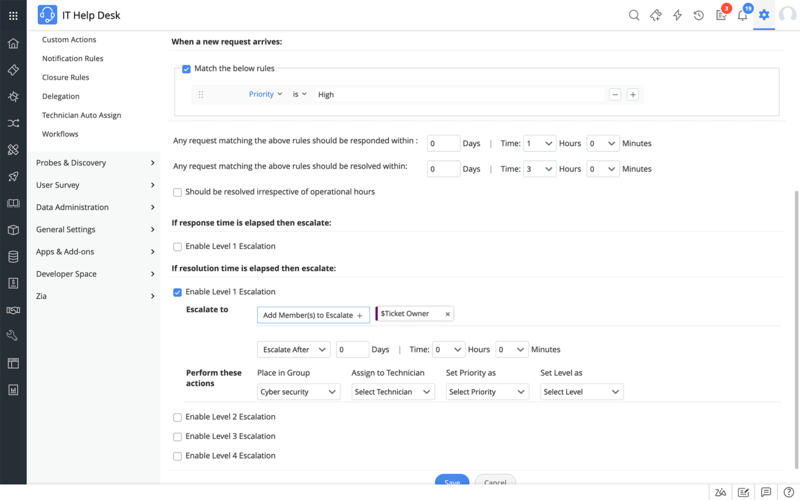 ServiceDesk Plus allows this and you could have the majority of your requests being handled in this way once you have defined your Business Rules. Learn more.. When users make a request to the help desk they will receive a confirmation that it has been received by your IT help desk software. 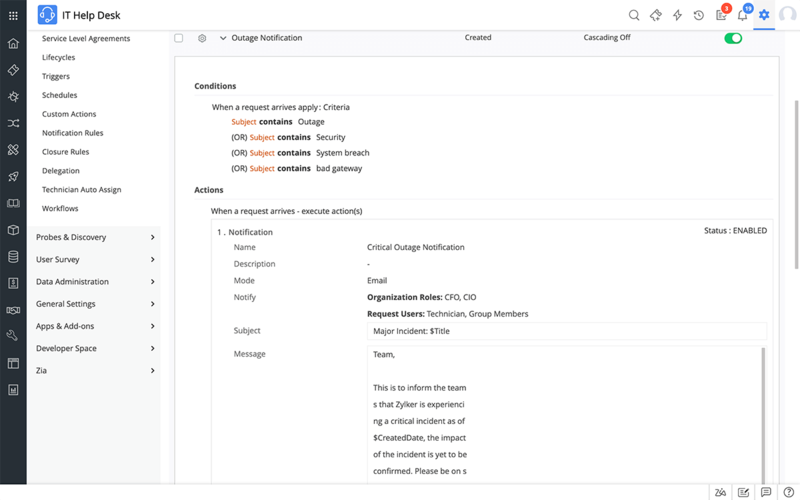 ServiceDesk Plus is so intuitive that it can also send out notifications when a ticket is changed or when it has been assigned to a technician or team. Learn more.. 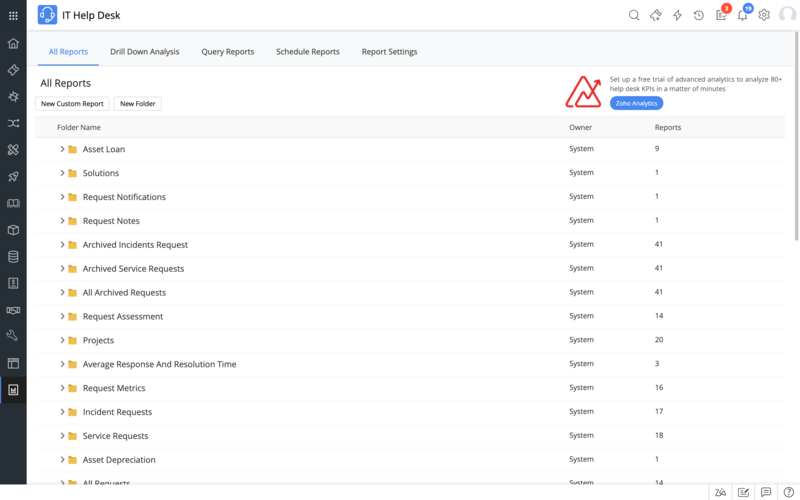 Reporting is so important in any IT help desk software and ServiceDesk Plus has all the reporting functionality you could ever need. Whether you need a report of technician performance or about an SLA violation, ServiceDesk Plus delivers time and time again. Learn more.. Giving users the ability to leave feedback can be so beneficial to the service you provide and can help you to streamline and improve on any weaknesses.